Hi all, just wanted to share screens from a quite early stage of a game based on VDrift and with rendering by OGRE. I used PagedGeometry, and resources (trees, terrain textures) from Ogitor. Its not much since I've done this by myself, also having a fulltime job. Hope it's not to early for posting this and that someone will like it. Last edited by Crystal Hammer on Mon Sep 21, 2015 8:26 am, edited 42 times in total. Nice job What physic system do you use? Btw, it's a pity that there isn't special version for Linux. VDrift does much of physics by itself (that's why it is a simulation) and since recently, it uses Bullet for car chassis collision (and probably will for future dynamic objects). I know, I just don't have any programming experience under Linux at all. But VDrift has a version for Linux, so it should be possible. How did you make the road over terrain surface? Yes, this was tricky, and it's still far from beeing perfect. I used so dense triangles for road as for the terrain, so they are nearly the same size (1m). And the road is placed about 0,01 m above terrain at each point. This resolved road tearing problem near camera when terrain is at its LOD 0. I also have depth_bias 6 for material, it helps, but it can't be to big. When too big road is drawn closer at distance, clipping trees and car. The triangle count is high, that's why some road LOD and paging is necessary (will write it some day, I guess). And what's the technique of drawing road? Sequence of coordinates of center of the road? It's just a regular grid created in ManualObject, nothing special. Are there impostors on this picture? No, it's an older one with StaticGeometry, that's why there are so many triangles (1,1M). What about crossing the roads? Yeah, that isn't managed now at all. Triangles at road crossings are z-fighting. There should be some sort of crossing detection that whouldn't make triangles at the same place. Or would create special triagles at crossing place and the rest of the road would have to snap to the crossing frame. But that's a much later issue for me. And the road that doesn't receive shadows - it's just temporarily? Yes, I've got shadows on road working, but at the moment from the first shadowmap only. It's new for me and I didn't have time to learn shadows and materials properly, so I'm just doing it as fast I can. Also there is no self shadowing now, and besides terrain and road nothing else receives shadows. Nice start! What kind of editor are you using to model the tracks? Maybe you should abstract their drawing to 2D to be able to identify crossings correctly (simpler intersection tests). I like Ogitor, it has nearly everything that's needed. I will use it for my future tracks, this one was just generated with sinus functions. There's no river/road plugin though. I will try to write such plugin to edit roads for it, if no one does. I intend to edit roads in 2D, those which stick to ground. I have tried to build ur project. and i got some problems when compling ogre with stlport.5.2. it seems ogre of the latest version don't need stlport's support.but if i don't use it.some linking errors listed. like:"error LNK2019: unresolved external symbol "public: static class OIS::InputManager * __cdecl OIS::InputManager::createInputSystem(class stlp_std::multimap..."
would you be kind show me some replies. This means you have to compile OIS with stlport.5.2 too (like all dll's). I would just forget about stlport. It's been a long, long time since you needed that. I wouldn't go for all that trouble with compiling everything with stlport if it wasn't the only way for me. Tried to compile VDrift (it's actally a Linux project) without it in Visual Studio 2008 and it can't be done because of list's and all std templates not alligned to 16 bytes. And since I'm so attached to VS2008 (since college, through 2 works) it would consume lots of time for me to even compile it in a different IDE environment. I'm actually quite glad that VDrift compiled in VS using stlport and didn't cost more trouble. Ogre is also easiest to be compiled in VS. But i guess it is possible to compile it in many other compilers. 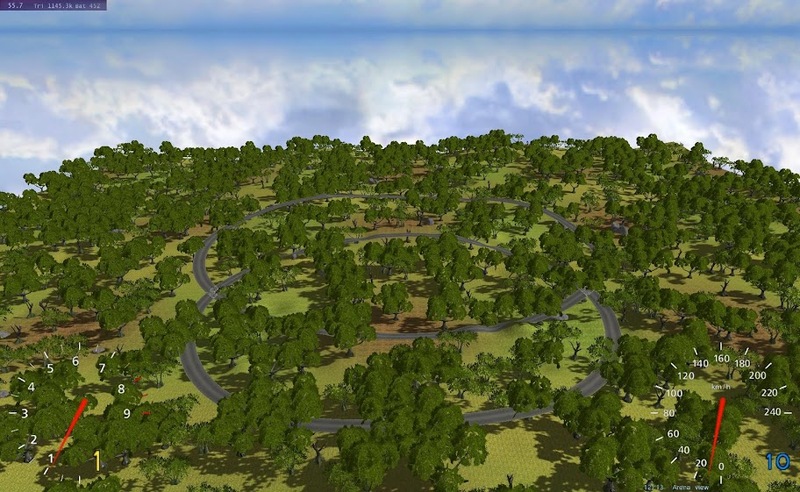 Anyway about the new release: I finally added roads, based on splines, and also with 4 LOD's. Each segment had 4 meshes and the one is visible for its LOD, which is computed by getting the smallest distance from near plane to 3 points in that road segment. They render quite well, other stuff is limiting Fps. Had some troubles with compiling QT Property Browser for Ogitor so my attempt to create a plugin for it to edit roads is delayed. It's compiled as part of the CMake script now. It seems to work for everyone, but I'm eager to hear if it can be bulletproofed further. Anyway this certainly isn't a easy project to compile here. I'm still using Ogre from svn compiled in april, and VDrift from may or so. Just don't want to update too often, I would then become an art for itself and block me from wrting new stuff. Looks like the vDrift people are breaking the rules..
Ogitor - including the Qt property browser - does indeed compile cleanly using VS2008. I might try VDrift myself, just for the heck of it. Impressive project you've got here. i did it.OIS processed well. but ogre still couldn't work with stlport. i used ogre(v1.6.5). which version of ogre do u use? I was using 1.7 from svn (but got it in april, don't know about newer). Looks like 1.6 didn't have them. I had some error in them, so I just commentend out the code in those functions, so they compile. I didn't use them ever, and it's something weird, I didn't even want to waste time to know what, It runs without them.